Q: So tell me again why you're sitting here and asking questions to yourself? A: Well, arbitrary voice inside my head, after bragging about my ability to pack clothes into very small spaces my friends started to ask questions about my new "system" that is not really that new and I've seen in many other places. I decided a Q & A blogpost would be the best way to direct them to the information while actually answering all the questions I've received. Q: You brag about your dresser organization? Q: And you still have friends? A: It's complicated I guess. Q: You won't after writing out your actual thought processes, that's for sure. A: SO recently Luke & I decided to free up some space in our room by using one dresser and one small side of average closet. I had previously had a lovely wardrobe that served its purpose but there were not enough drawers and the thought of having both a dresser and a closet taking up space really annoyed me. After a surprisingly fruitful virtual jaunt on to Kijiji we were able to get it out and then get locked out of our house on the coldest day of the year. Q: Why didn't you bring the keys? A: I thought Luke had them! Q: Stop blaming Luke for your mistake! A: I'm not I just...! ...Anyways, the wardrobe sold faster & for more money than we expected. After looking at some lovely pieces, I pined for my old dresser still in my old bedroom at my parents' house. 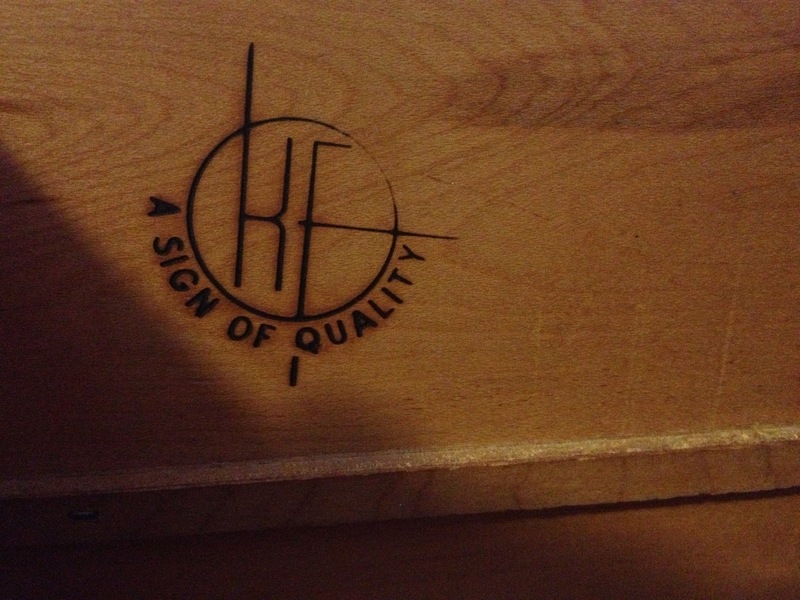 It was very flexible of them to give it to me; the highboy was part of a set that had been handcrafted in the 1960s with lots of adorable details like French swear words pencilled lightly inside and a slightly off centre branding. Reunited, Luke & I started to divvy up the drawers. Q: How much space do you really have? Q: No, no you have a crapload of clothing. I've seen you. Wait, I am you. You're always wearing different stuff. A: I worked at Elsie's for a few years and still do the odd Saturday shift. That store has got me through every job interview I've ever been to and every formal occasion I could ever need. Between that & Value Village, there isn't much I buy elsewhere other than really special pieces. I really hate buying new clothes because they haven't been washed before; you can't see how they wear. The best clothes are the ones that are clearly worn but still look amazing; those are the ones you'll have until they really can't. Q: You're bitter that the fancy new work dresses you got new are pilling already, aren't you? A: What a waste of money. A: With these resources, I frequently get rid of items a few months after I get them because they were 4$ so who cares? Between lifestyle changes, weight loss, and boredom, a lot of people are actually surprised by how few clothes I own. Q: So that's a long way to say you don't have that many. A: I don't, but I do have formal dresses with emotional attachments, some of my grandmother's old pieces that I won't part with, Luke has a suit he seldom wears.. we're human I guess. Q: Enough talking. What do you do? Q: Why would you roll it instead of folding it? A: It doesn't crease! It's ingenious; it takes up an eighth of the space. Q: So you roll your clothes and lean them against each other? 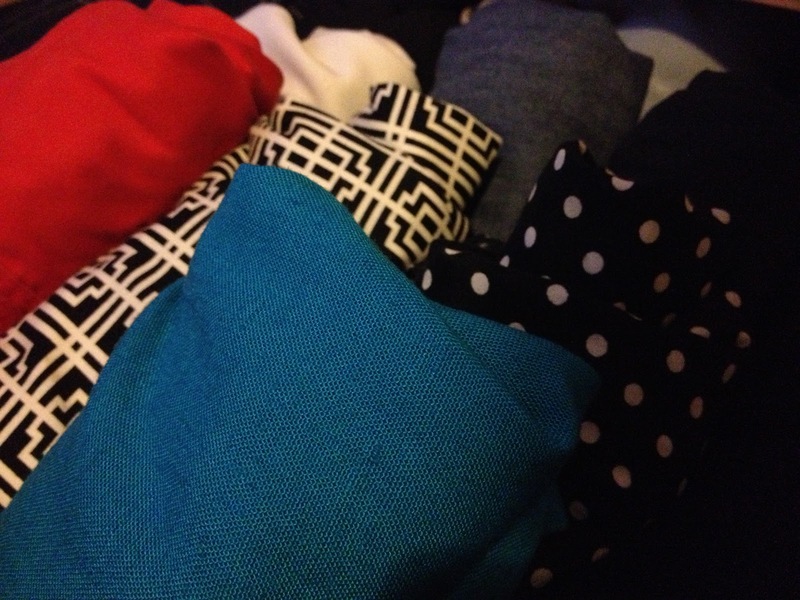 A: I do for shirts, skirts, dresses, and cardigans. I fold pants and hang anything that's really structured. Q: Isn't it hard to maintain? A: If you have a hard time putting your clothes back where they belong, this won't change that. But I find rolling easier than folding. Q: What about weird items? 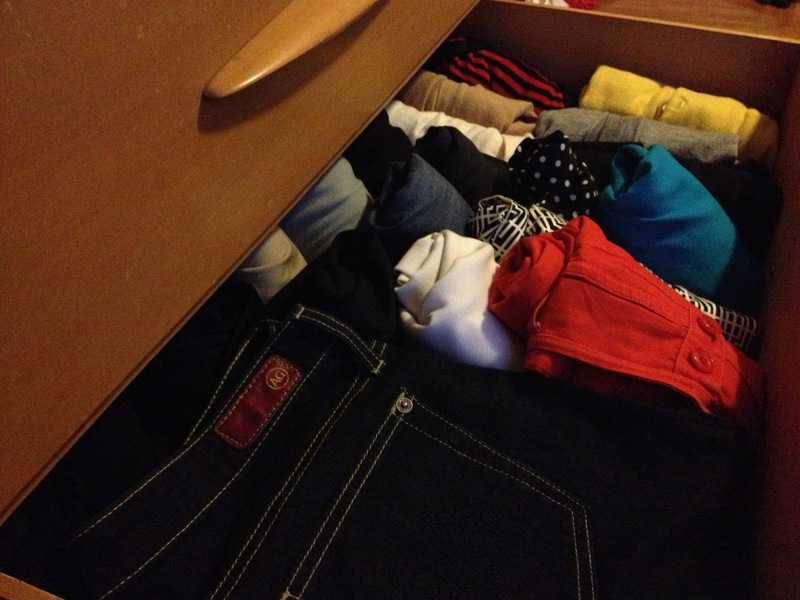 A: My swimsuit and leggings are rolled up behind my jeans for when I need them. My underwear & socks are bunches & put into plastic drawer dividers so I can easily find a pair? Q: I'm having a hard time visualizing that, mind uploading a picture? A: There are creepy people on the internet. Q: Aren't you kind of OCD? A: I think I just spilt hot chocolate on my white sofa and I don't care. A: It's really helpful! When you see everything it's much easier to pick what you actually want that day! 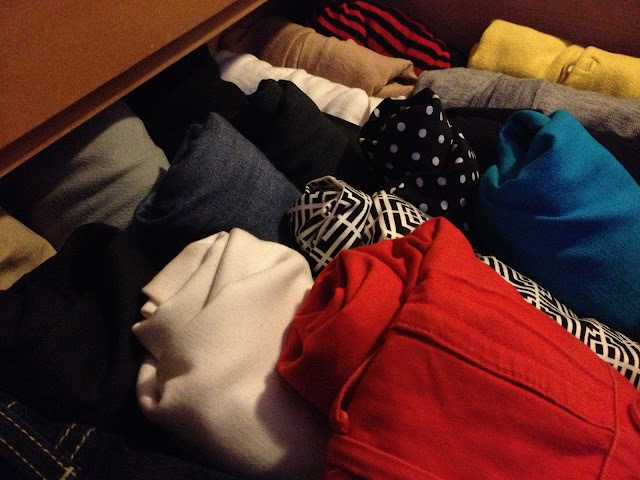 When I open my drawer I see all my clothes instead of just the first one or two folded on top! Q: Hmm you're almost done but I'm your brain so I'm going to just hum a weird mash up of all the songs you've heard in grocery stores and only know a few words from for the next five minutes. Q: DUN DUN DUN SOLSBURY HILL DUN DUN DUN TWIST AND TEENAGE DREAM. A: This is so embarrassing! I can't bring you out anywhere! Q: I know right? Remember that time at trivia you forgot the capital of Kosovo? Hahaha and you study flashcards and everything! Q: This is why you don't show people the real me. A: I'm not listening to you. Q: Want some more hot chocolate? oh my god what if they made nutella hot chocolate? Do they? Can we watch Parks and Rec all day? Did you see those gifs yet? Do you think you're a trope because all you think about is Nutella and Parks and Rec? Okay think about something serious to impress people... No not something from NPR you pathetic shell of a person! You're only worsening your stereotype. A: This is why I'm not good at multiple choices or any social situation ever. Q: Let's go stir nutella, rice crispies, and marshmallows together and microwave them. A: I'm off that stuff remember? Q: God no, not your stupid avocado/ spinach salad again. A: I won't back down. A: Okay, for everyone still reading, this system is awesome, your clothes don't get bent, you can see them all conveniently and you can fit a surprising amount in 3 average sized drawers and about 24 inches of hang bar. Q: No one is still reading this. You've scared them all away like you do all your friends. A: Let's go stir nutella, rice crispies, and marshmallows together and microwave them.